When it comes to toners, I don’t really get excited. I have tried a few but I have never noticed any difference. So, I’ve just considered their use as another useless step on my daily skincare routine. That’ s why I didn’t expect much by Instant Boost Skin Toner. 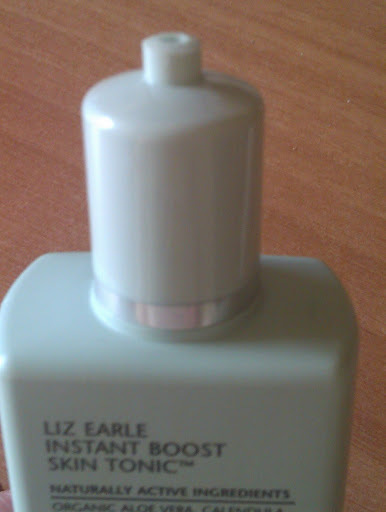 I love Liz Earle’s products but I was sure that this product would disappoint me. What did motivate me to try it? The ingredient list; it is paraben-free, it doesn’t contain alcohol and the main ingredient is Aloe Vera, which has antioxidant properties, moisturizes the skin and gives it a nice fresh feeling. Instant Boost Skin Toner is liquid, slighter heavier than water, probably because of Aloe Vera. How to use? Pour a generous amount of product onto a cotton pad and then sweep it over your face and neck in gentle circular movements. Apply daily morning and night. Once applied it gives a barely tacky feeling on my skin. At first I didn’t like that, but I realized that this feeling disappears instantly and the toner is quickly absorbed. That’s nice because I don’t have to wait to apply my moisturizer. The first thing I noticed was the floral scent. The smell is quite strong, but pleasant. I don’t really like floral scents, but this one doesn’t bother me at all. It feels so refreshing! This toner is suitable for all skin types. But does it really work? Oh yeah! Even if I use the toner once a day (and not twice as it is recommended) I can notice the difference. My skin seems healthier, brighter and feels more clean and refreshed. The Instant Boost Skin Toner also soothes my skin and leaves it hydrated. Thanks to the antioxidants, this toner keeps skin in great condition and the beneficial effects are more visible in the long run period instead after a month. The container is a tube that twists up to reveal a hole. I don’t really find it comfortable because sometimes, when I twist it up, some of the toner pours out, getting wasted. However, if you’re interested in trying this toner, don’t let that put you off. It also comes in a spritzer container. Have you ever tried this toner? What do you think about it? Let me know, girls! @glittermeup@iliana I adore Liz Earle as well!!! @Demi No,it doesn't.But take a liok at the ingredient list.You can find it at Liz Earle's site.Just to be sure 'cause I am not home and I can't check it! Does it contain salcylic acid? I'm looking for a new toner and i think this one maybe is my new! "it doesn’t contain alcohol and the main ingredient is Aloe Vera" I loved it just from this phrase! And the fact that it comes in different sizes for different prices is very convenient!